In Los Angeles, fall fashion arrives a bit later than it does elsewhere, with October’s pumpkin patches serving as a much-needed alert that it’s time to change up your wardrobe. Despite the continued heat, it’s officially time to ditch summer styles, so we’ve enlisted some of LA’s top fashion bloggers for advice on making the switch to fall. They’re telling us what we should be wearing this season, how to steal their style and what embarrassing items we should shove to the back of our closet ASAP (hint: bye, culottes). Which fall 2015 trends are you wearing? Suede boots, rich camel/burgundy hues and lace paired with gold accessories. Where would you shop those trends in LA? Reformation is great for the seasonal, trend-based blouses and dresses, and Barneys NY in Beverly Hills is where I’ll shop for investment pieces. I also love Scout LA—they scout the best designer vintage relevant to trends now. Any key purchases you’ve already made for this season or would recommend making? My key purchases have been a camel brown Saint Laurent crossbody bag, suede Gucci boots and a vintage lace dress I scored on Ebay. Lady loafers! I already started to bust mine out when I was in Paris and felt the first hint of fall. I love the geek-chic vibe they add to any outfit and you will 100 percent see me wearing them a lot this autumn season. I picked up my favorite pair of Proenza Schouler shoes from Barneys NY, and I would also suggest Noodle Stories, Anine Bing, Curve and Zimmermann. Carwash pleats are another trend that I’m loving right now. My favorite one is by Tibi. 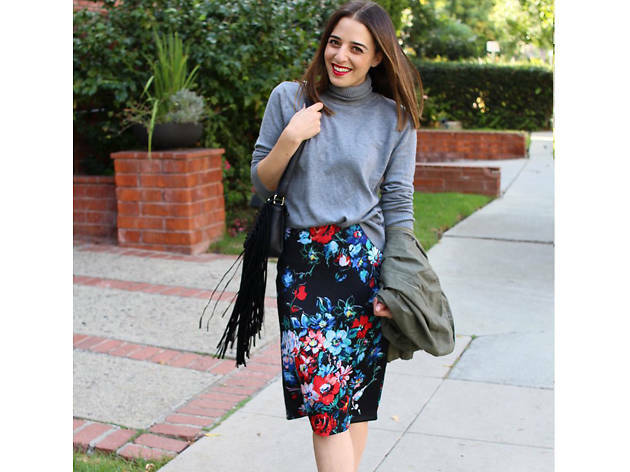 I love pairing pretty pleats with a chunky knit on top to give balance to an outfit. Furry Feet [Shoes covered in hair]. Military, lace and silk slips under oversized sweaters, pleated skirts, gray and neutrals from head to toe. Barneys NY, Nordstrom, Mango, J Crew, Club Monaco, Fred Segal and Vince. Wasteland for designer vintage. A military jacket, gray suit and colored leather skirts in army green and navy. Any form of denim, especially frayed. I'm all about the return to the '70s that's happening right now, including chunky wrap knitwear, suede, fringe, embroidered vests and dresses… and, of course, shearling coats à la Kate Hudson in Almost Famous. General Store, American Rag, Madewell and Principessa. I bought a tribal quilted blazer from Crossroads Trading Co. and a midi-length printed puff long sleeve dress from Zara that I'm obsessed with. Sleeveless vests, ripped black jeans, anything monochromatic, chunky knits and turtlenecks. Library and Hardwear, both on Larchmont. Any key purchases you've already made for this season or would recommend making? Black Orchid Denim ripped jeans, black leather brimmed hat from the Kooples, sleeveless long blazer from Topshop. Monochromatic black is always chic. Flare jeans. I just can't. Unisex silhouettes for menswear is, by far, one of the biggest and most exciting trends. Other than that, you’ll most likely find me in jumpsuits, casual but structured trousers, voluminous long bomber jackets, thoughtfully-distressed denim and lush designer sneakers. Although I mostly shop online, I highly recommend the following LA-based boutiques: Choukair, Barneys NY, G-Star Raw, Kin, H. Lorenzo and Maxfield. A G-Star RAW sleeveless, black jumpsuit and 3.Paradis bomber jacket are already in rotation. Perhaps a little overkill in this current heatwave—but I’ve always dressed for myself and not the weather. 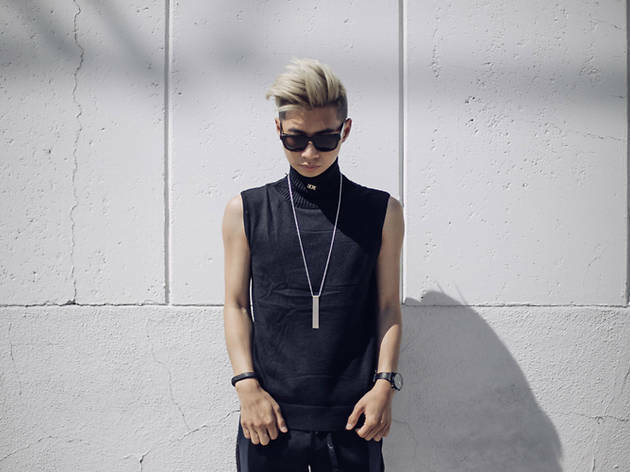 Monochromatic and sleek agendered apparel. Over-the-knee boots, skinny scarves, monochromatic grey, statement jewelry and hair pieces. I'm an online shopper! Nordstrom, Zara, Forever 21 and Nasty Gal. Any key purchases you’ve already made for this season or would recommend marking? Sam Edelman leopard booties from shoes.com. For some reason, I think I've seen UGG boots come back. Also, culottes! I'm in love with Minnetonka moccasins, Pendleton prints and Free People sweaters. I mostly shop online, but when I do shop in LA, it would be at the Grove or Third Street Promenade. I also love specialty boutiques in Silver Lake, as well as Melrose Trading Post, Una Mae's, The Way We Wore and even Goodwill! I bought four pairs of Minnetonkas and they're so comfortable and practical. I also bought a wool hat to update my accessories closet and a new pair of Pikolinos boots from Spain, which are a lovely shade of green. Fringe everything: boots, bags and jackets.